Oh happy day! 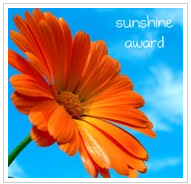 Laure from Painted Thoughts has just given me this great Sunshine Award for creativity & positivity! I'm thrilled - this has totally made my weekend. So I get to hand this on to 12 blogs I love - that might just be new to you, so I highly recommend you take a look! Nancy at Linens & Laurel - who promised us all a new project every day this year - and has kept it up! Phenomenal (I know I couldn't keep this up for a week!). Blanca at Magic Moonlight - who has her own blog and Magic Moonlight freebie images. 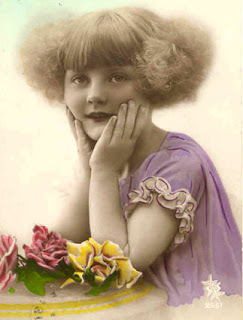 Tons of lovely vintage images for you. Blanca is so generous - I don't know where she finds them all! Sophie at My Cup of Milk Tea - a young Chinese lady who designs the most exquisite free blog backgrounds and headers. An undiscovered treasure, in my opinion. CC at Lace'n'Ribbon Roses - because she is just so enthusiastic about her favourite craft, so you have to love it too. Tina at Beansie Babbles - because she also is so enthusiastic about her favourite craft (crochet) and even writes her own patterns! Anyone who shares the love like these two ladies deserves an award. Delicious Scraps - wonderful elements, and commercial use too! A must for scrapbookers and digital artists. Deb aka The Scrappin' Cop - a Photoshop genius, great brushes & textures: tutorials as well! Glamour Bomb - who deserves an award for merely existing (never mind she does the most amazing videos etc and her blog is To Die For). 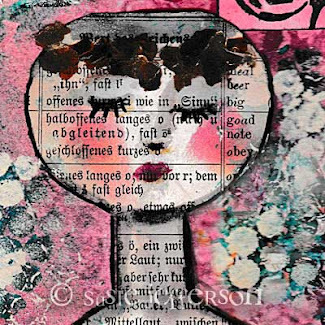 Carmi at Carmi's Art/Life World for gorgeous cards and other artwork, and great tutorials. Sugar at Lipsticks , Lace & Lolly Dolls - the most amazing photographic site. Stunning. Check out her other blogs as well. Violetta at VM Creation- the most exquisite fashion illustrations and designs, beautifully made into some fabulous creations. Her other blog is lovely too. Blondie at Blonde Episodes for wonderful photos, great bios and great research and attention to detail. If you love old films, you have to read her blog. Squeeeeeeeeeeee! My first award! Thank you! How fun! And while you surely deserve the award for sunshine and positivity I must say you've also earned it for excellent problem solving. Whenever I have a problem with my computery I'm off to study my Blogology at 1stFloorFlat! It's you that deserves the awards..for all you do for all of us..and you're truly such a sweet,gracious lady. It's my honor and privledge to know you and call you friend.You deserve the sweetheart of the year award..and if I knew how to make one..you would have it. Thank you so much for thinking of me..hugs from Texas...where we are having 2 days of snow again. Where oh where is springtime????? Thank you SO much,my dear friend!!! These is extrimely made my day!!! I would like to say you that I am under impression about all followers of you from these beautiful Blog Land-the are magic talented womans!!! Thank you so much! In the midst of all the crazy deadline I have right now it was lovely to receive a happy comment! Wow, thank you so much for the wonderful award! I really wouldn't say that I'm a Photoshop genius though! I'm more in the "still learning" category! I appreciate your kind words and thoughts! Have a fabulous week! Hope you and your loved ones have a great week! Oh congrats to you and our sweet friends you passed it on to! You're so precious to think of me when YOU are the one that does so much for so many!! You're my role model. Well now that I've gotten an award, I'll do my happy dance and get busy on creating something new. This last year has been such a crazy, haphazard time but with Spring comes new beginnings. I've just been checking out these other bloggers and see why you enjoy them so much! Every one is so creative! Thank you for your friendship and your inspiration. Hope you know how much that means to me.